Cook pasta, reserving a cup or two of the pasta water. Brown the sausage with pepper, seasoning mix, garlic. Remove sausage mix to plate, keep warm. Next we’re going to make a basic white sauce. White sauce can be used for all kinds of things, and it’s worth mastering. Here we go… Add butter to drippings in the pan, melt. Add flour, and mix into a paste. Work quickly so it doesn’t clump up. When the paste is smooth (or mostly, anyhow), slowly pour in milk while whisking. Add the sausage mixture back in, and add pasta water until the sauce is the consistency you like. Stir in the pasta, and voila! I sprinkled mine with some Tony Chachere’s (yeah, yeah… creole, not cajun… whatever). heat the oil, add the squash. Sprinkle with seasoned salt. Put it all in a blender. Add ice till it’s the consistency you like. We had it pretty runny, and it took a couple of cereal bowls full. I topped each cup with a little bit of Reddi Whip. We often look at babies and say, “Oh, how precious!” And rightly so. They ARE precious. But what, exactly, makes them precious? They have not contributed anything to society. Young babies cannot talk or care for themselves in any way. If we’re being honest, babies are often downright inconvenient. They cry loudly, demanding attention, care, and love. They make messes which others have to clean up. Is it because they are cute? Of course not. “Ugly” babies (you know what I mean) are still precious, and no less so than the cute ones. So what, exactly, is it that makes a baby precious? What does “precious” even mean? Precious describes something that is of great value, something not to be wasted or treated carelessly. Precious describes babies. And two-year olds. And five-year olds. One day a question occurred to me… at what point, what age, would someone stop being precious? If a baby simply IS precious— precious without contribution, cuteness or practical value— then that preciousness cannot fade or be altered. The baby cannot do anything that will make it less precious. I cannot do anything to a baby that will make it less precious. Babies are precious because they simply ARE. It follows, then, that the baby will always be precious, even when it is no longer a baby. Even when that baby has grown into a toddler, a child, a teenager, and even if “sass-mouth” is an accurate descriptor. That baby will still be precious even when its second decade rolls around, and even when its third decade rolls around. It follows, then, that I am precious. It follows, then, that YOU are precious. No matter what you have done. No matter what you have not done. No matter what your accomplishments are, or aren’t. No matter what you look like. No matter what you weigh. No matter what you think, or feel, or believe. No matter what. And if you are precious (you are), then you have great value. You are not to be treated carelessly. You— your life, your body, your talents, all that is YOU— is not to be wasted. This, for me, was a profound realization. And its impact is deep, the implications many. It’s a realization I have to re-realize often. But each time I have this re-realization, it sticks longer, and harder. And the implications become easier to act on, to maintain. It doesn’t matter what others think. It matters whether or not I’m living up to God’s standards, and it matters what my husband thinks. Other than that, no one’s opinion matters even one whit (which is not to say that their advice is meaningless, unwanted or useless… but once a decision is made, others’ opinions become moot). Taking care of myeslf is not only okay; it’s necessary. It’s okay to have a down day, and it doesn’t have to be a down day by global standards. Denying a down day only makes it worse. An ounce of prevention is worth a pound of cure. Maybe two. If I keep up my self-care, or at least most of it, things go much better for me. Word definitions matter. Things get twisted on a blue day. Words that might be harmless one day get redefined, and turned into weapons. This is one of IB‘s best tricks lately. “Silly” means “fun” on a good day, but on a bad day, it means “frivolous and bird-brained” (don’t we say some ugly things to ourselves? I’d never call someone else bird-brained!). I can turn a down day around… at least somewhat. My list could go on and on. But I’m so excited about this progress. There’s a passage in the book Unbroken by Laura Hillenbrand** (it’s not in the movie) about the stranded soldiers in a partially deflated raft with sharks below, occasionally rubbing their backs on the bottom of the raft. The guys on the raft don’t know when a shark might jump over the edge and try to drag them down into the depths… and THAT is what depression felt like. It felt like one wrong move would bring the sharks. I felt the sharks just below the surface always. If they swam away for a moment, it wasn’t a relief, it was a terror that when they struck, it would be doubly hard. My hair went from several inches past my shoulders to touching the tops and lots of layers. By the way, some numbers say I’m a millennial, but my selfie skills say I’m not. Haha! Today I spent the end of the day by myself, out and about. Honestly, it took some pushing from my husband for me to do it. But I’m glad I did. This morning I decided I wanted to celebrate this anniversary, and I knew just how I wanted to do it. I feel like I’ve come a long way in fixing my inner monologue, cleaning up my self-talk, and now I want to shift my focus towards self-care. My plans were along those lines. I wanted to go get my hair cut (something I haven’t done in over two years) and I wanted to sit at Starbucks and reflect on & write about the past two years. Over the course of the day, IB did his best to turn my planned celebration and self-care into a silly self-indulgence. And it worked. Once I handed the kiddos over to Jeremy and was trying to pick out a new hairstyle, the twister’s twisting had done its work. But Jeremy encouraged me to go. And my dear best friend (who always takes his side!! Sometimes I tease her that I need a new best friend who will take MY side every once in a while!!) encouraged me to go. So I did. I got my hair cut. The sweet stylist didn’t even charge me for the shampoo & style that she should’ve, so I tipped generously and was still able to go get some of the products she’d used to fix my hair (in cheaper Walmart-available versions). Then I took myself out to dinner, and did some journaling while I ate, and now I’m sitting at Starbucks in the warm July (amazingly bug-less!!) night air… writing this. Before I sign off, I want to make something very, very clear. I am NOT saying that what worked for me will work for everyone. I am NOT saying that I have found the solution for depression and suicidality. I am saying that this has really helped me, and I’m glad, and I’m inviting you to be glad with me. That’s it. If any of it helps you, too, fantastic. But I have no way to know whether it will or not, so if you need help, then please, please, please GET HELP. Get whatever help you need, and the sooner, the better. **I really enjoyed the book Unbroken, BUT… you’ve heard of cussing like a sailor, right? Well, sounds like some soldiers in the Army aren’t much different in that regard. There are definitely some R-rated things in there. To be quite clear, this post is NOT going to explain how to make 15 meals in under 2 hours. For that, you’ll have to go to the original source (which– spoiler alert– I highly recommend you do). This post is to get down what we thought, to explain how we did it, and what I’d do differently if/ when we do it again. We have a bunch of freezer bags leftover and some other ingredients too. We’ll need to purchase things like low carb tortillas, fajita toppings and some veggies for side dishes later, but c’mon… $140 for 15 meals that will feed my crowd of 8??? That’s awesome. We really weren’t in a hurry and didn’t even try to get it done in under 2 hours. I bet if we had been, my husband and I coulda knocked it out in about 45 minutes, not counting cooking time. It’s FREE. Honestly, I’m amazed Jen at WorkingatHomeschool is offering it for FREE (did I mention it’s FREE?). There *is* a lot of advertising on the site. Just slightly above average for a blog, I’d say. She has several other free plans, too, including Trim Healthy Mama (THM) friendly breakfast burritos, which is what I think I might try next. Downloadable, PDF format, 9 page packet. In the packet, there are lots of helpful things. The things I found most helpful were the shopping list, prep directions, instructions for prep stations, and the step-by-step directions. There are two inventory sheets in there too, but I have a different system (which I’ll share further down in this post). I do kinda wish there were suggestions for sides because I stink at coming up with those. This is meant to be for Trim Healthy Mama followers, so if you don’t have the cookbook, you’re pretty well sunk. We haven’t had any (except one) of these recipes before, so I can’t vouch for them, but they look great. I don’t think we’ve had any THM recipes we didn’t like. Well… except for the smoothie that had okra in it. Not too shocking that we didn’t like that one. Some are stupid-easy. Which… to be honest, makes me feel a little silly to be freezer prepping them, but it’s like my sweet hubby pointed out: that’s just less work, so isn’t that a good thing? I love that several of the chosen recipes are Fuel Pull. That means I can make it whatever I need it to be (S or E or even keep it FP) with the side dishes. Next time, I would only buy 2 square foil pans. You’ll see why below. We had too much mix for the two foil pie pans, and ended up putting it into three. Next time, I’d make it in two square foil pans… and remember to add the bacon. Actually, next time I’d probably just skip this recipe. My gang aren’t frittata people. Wacha Want Mexican Chicken (FP): We just dumped the salsa in the bag of chicken without dividing it into gallon size bags. We used half ground turkey, half 85% lean ground beef. We cooked the meatloaf rather than freezing it raw. There’s a note that she froze it raw with the sauce on top and it was “juicy.” Seemed better to cook it before freezing it. We’ve frozen other meatloaves raw in the past, though. The meatloaf shrank a lot, so we dumped off the fat, wrapped it in foil and put it in a gallon-size bag with a baggie of the sauce in with it. More freezer space! Next time I’d just make it in my regular 9×13 pan. Papster Thighs (S): This is really just chicken thighs with seasoning on it, so instead of using foil pans, we just put the seasoning in a baggie and stapled it to the bag of chicken with instructions written on the baggie. Slow Fajitas (FP): Next time I’d make it with venison. I kinda jammed everything for one recipe into one gallon-sized bag. Next time, I’d dump the ingredients straight into the frozen bag of chicken. Instead of chicken broth, I added water and chicken bouillon powder (probably not *technically* on plan… don’t tell the THM police). As promised, my freezer inventory system explained… It’s really not complicated. 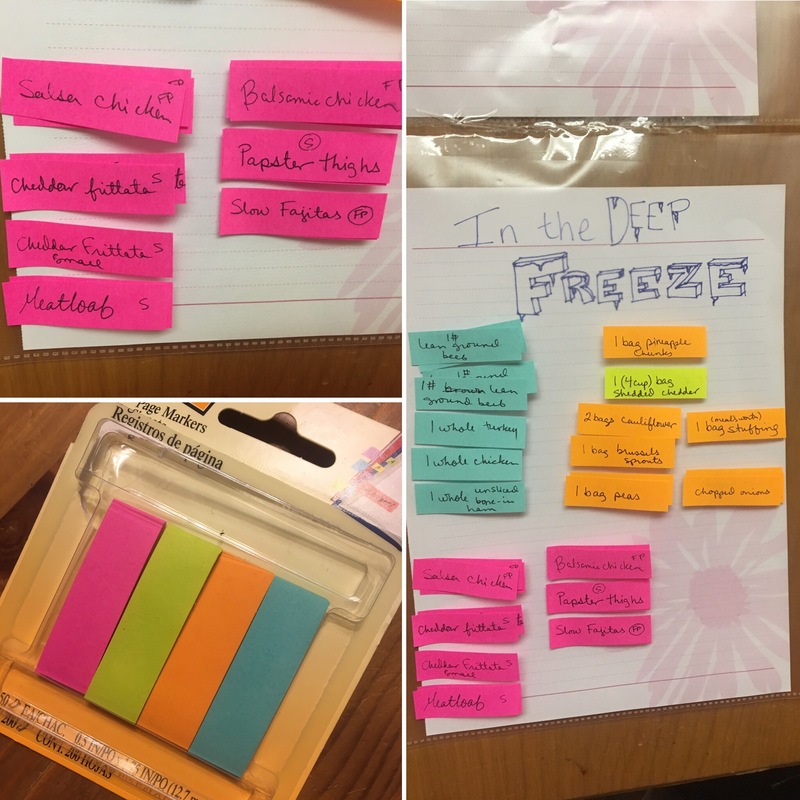 I have a paper inside a sheet protector posted inside one of my cupboards that says “In the Deep Freeze.” I wrote the name of each item on a little post-it– color coded, one item per post-it– and stuck it to the sheet protector. For example, today I made three batches of Balsamic Chicken, so I put three “Balsamic Chicken” post-its on the inventory page. When I use something, I take off the post-it and toss it. Spiders and I… we’re not really friends. There’s a meme with a house up in flames and the caption, “There was a spider, I panicked. But I think it’s gone now.” I don’t know… sounds like a pretty reasonable response to me. The other day I was driving our 12 passenger van when I spotted a rather large jumping spider just to the left of the windshield. In other words, it was only about 12″ from my head. I’d like to tell you that I calmly pulled over the van and smashed the thing, but that wouldn’t really be blog-worthy, now would it? And I wouldn’t get to tell you the best part. But more on that in a minute. It took some deep breaths to do it smoothly, but I got the van pulled onto the shoulder of the road, slammed it into park, and clambered over to the passenger side. Isaiah is my spider guy. He finds them fascinating and really enjoys learning about them. We have a long-standing agreement, though: he kills them when I ask. I don’t think he minds, anyway. He’s done it enough times that he knows the drill pretty well. Don’t take a shot unless you know it’s going to land. A disappeared spider is worse than a spider in plain view (you know spiders like to ambush, right?). Isaiah came forward, shoe in hand, ready to do his duty, but the spider was sly, and stayed in the nooks, crannies and crevices where Isaiah couldn’t get it. Meanwhile, my panic was rising. I called Jeremy, but he didn’t answer the first time… or the second… or the fifth. When I finally got to talk to him, I explained the situation, and told him he needed to come immediately. While we waited, the boys and I watched that spider constantly. The only time I took my eyes off of it was when I was checking to make sure the State Trooper across the highway was still occupied. I was sure he’d seen us and would come over as soon as he was finished with the semi he’d pulled over, and that was a conversation I didn’t want to have. There’s just no good way to explain that you’re pulled off the road and standing on the running board of your van because you’re scared of a spider smaller than a nickel. I’m all for backing the blue, but I’d rather not be their source of entertainment. When Jeremy arrived, he asked where the spider was and in less than a minute, the creeper was on the asphalt. Jeremy hugged & kissed me and said, “Now let’s get out of here before the police man comes over here” (read my mind!). So he rescued me. But that wasn’t the best part. The best part was at 3:08. There could be no better response. He didn’t laugh at me, chide me, or even smirk. He counted it his honor to save me from fright and embarrassment. I’ve thought a lot about that statement. His privilege. How so? Well, he’s the only one I’d have called without hesitation. He sees a side of me, knows depths of me that no one else knows. And not only does he love me anyway, but he considers it a privilege. And that’s simply… well… I just don’t have the words. But it’s just a blue day. It’s nothing like these days used to be before I got my tattoo. It would be hard to express just what an amazingly effective and positive tool my tattoo has been. Even on blue days, I don’t have thoughts of ending my “sentence.” I’m not scared of myself or what I might do. I’m MUCH more in control. And I know the blue will pass (I can say that it’s just a blue day). Another huge difference between then and now and is that I’ve learned what to do. 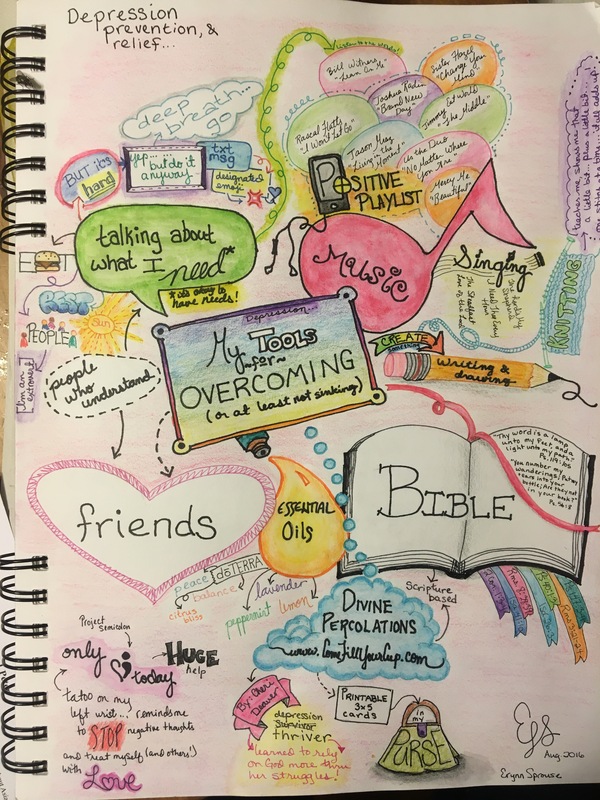 It isn’t exactly that I’ve learned how to help dig myself out, but I have learned some things that help me cope, get along, not sink… and I drew this to help remind myself of the tools I can use. I hope it’ll be of use to someone else, too. The first thing I do when I start to feel that cloak settling down on me is to eat. Something. Anything. Usually, if I think about it, I realize that I haven’t eaten in some time. The next thing I do is either sing or put on some music. Then I text my best friend. From there, it’s survival mode. If I were sick with the flu, getting better would be the focus of my attention. It’s kind of like that with a blue day. I’ve learned to give myself permission to shift focus from getting stuff done to meeting basic needs (mine and the kids’). Sometimes the blue cloak comes out of nowhere, but usually I find that it comes when I’ve been neglecting self-care. If I use my tools constantly and consistently, I can pretty much keep the blues away. If you read this and have questions about any of this, I’d be happy to help in any way I can; just leave a comment with your question or if you’d rather talk privately, just say so, and I’ll contact you by the email address you register with. Around here, we have a few favorite traditions, and here are some pictures about them! 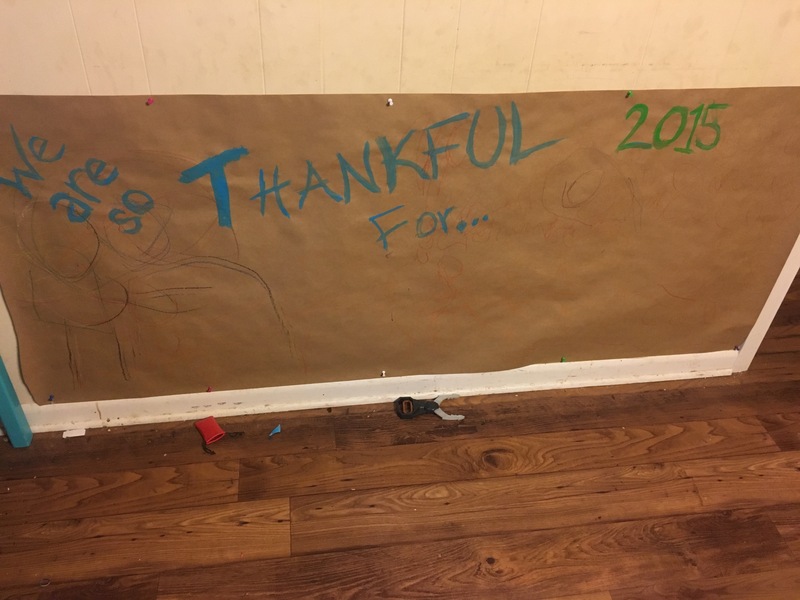 Wall of Thankfulness— throughout the Christmas season, the kids get to draw about things they’re thankful for on a giant piece of paper tacked to the wall. It’s a great way to focus on blessings… and an easy thing to send them to do when they’re making me crazy… err… I mean when they need an activity. Charlie the Christmas Chimp— He’s a (distant) cousin to the Elf on the Shelf, and quite closely related to the Christmas Mouse. Charlie announces fun activities, hands out good deed assignments, praises the kids for good behavior, brings treats… whatever we want him to do. 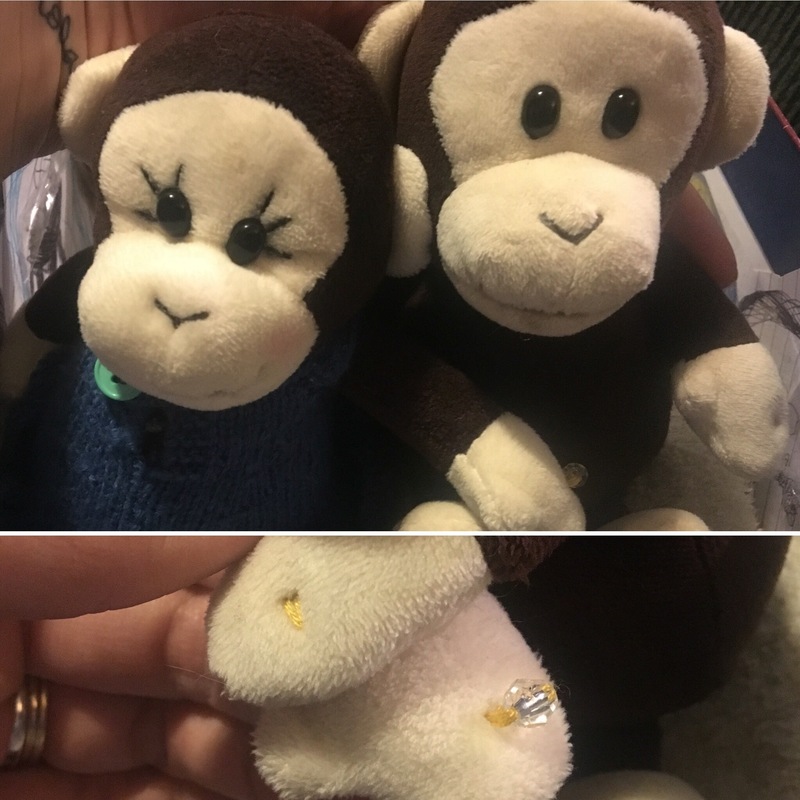 Last year he married Charlene and the boys got to plan their wedding reception (the crazy chimps eloped). Today was Charlie’s debut for this Christmas season and the first assignment was as it has been the last few years: make him a house. This year, Charlie specifically requested the house be decorated (he’s married now, you know. No bachelor pads here!) and the boys came thru. They made plenty of art, complete with Spirograph frames. 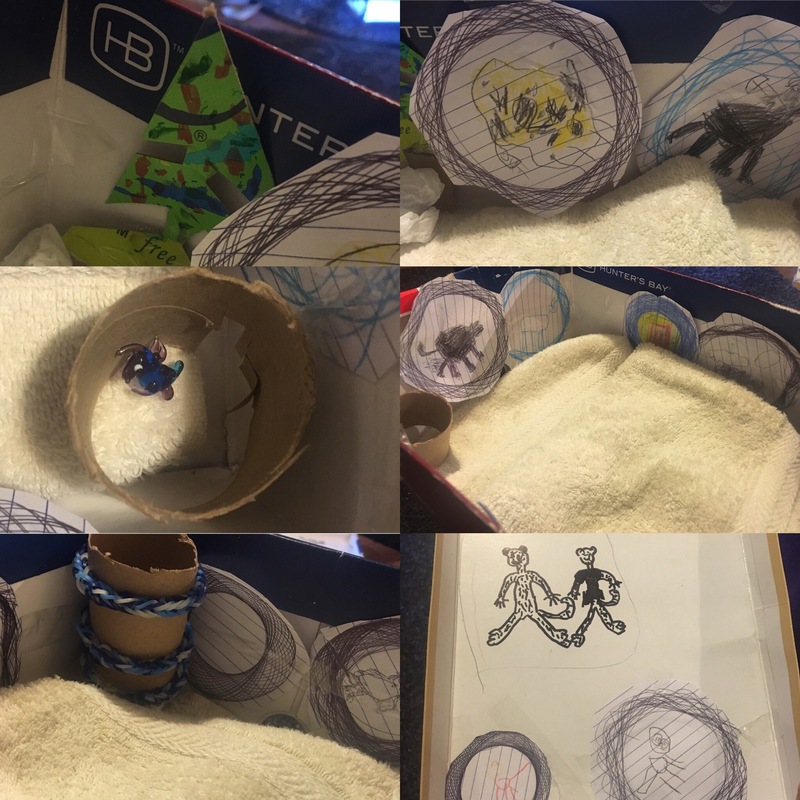 There’s a Christmas tree, a pet in its own cozy tube, and even bracelets and a necklace on a “stand” for Charlene. They didn’t forget to decorate the chimps’ ceiling either, where they’ve taped a portrait of the happy couple. Annual Ornament— each year, each kid picks a new ornament. We try to encourage them to pick an ornament that means something, but often it’s simply one they like. 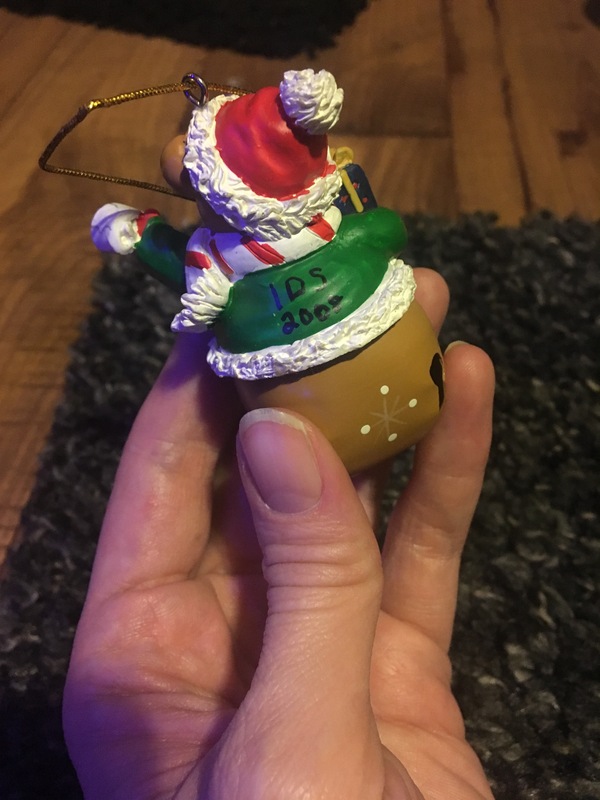 It gets labeled with the kids name or initials (depending on space) and the year. Each year, they get to hang their own ornaments on the tree. 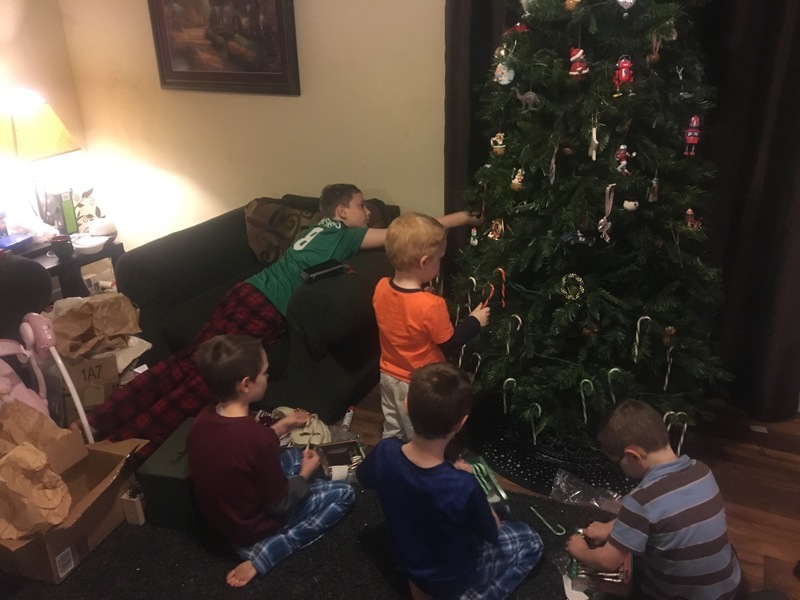 The rest of the tree gets filled with candy canes– a tradition we carried over from my family. When we’re done decorating the tree, we have cups of eggnog by the tree and this year we added a toast with “clinking” of glasses. Snowball fight— okay… we live in Texas. So obviously, this isn’t a literal snow ball fight. But “snowball fight” sounds much better than “balled up grocery bag fight,” even though the second is more accurate. This happens on Christmas Day and I’m looking forward to it. We run around and throw the “snowballs” at anyone and everyone and it’s just a ton of fun. This is actually a tradition we took up after an ill-advised attempt to establish a traditional silly string fight (silly string stains white walls. Who knew?). These are some of my favorite traditions. There are more (so many more!) because… I don’t know. Traditions are very important to me. I like the way “we always… (did this or that)” bonds a family and makes the holiday special. Schedules and routines give me hives, but their cousin tradition is a welcome glue and memory maker. I’d love to hear about your favorite Christmas traditions!